Woodrow Wilson writes to ask William C. Redfield about speaking regarding the tariff in the upcoming elections in Maine. I hate to burden you with extra tasks, but we have a most important and interesting Congressional election pending in Maine and nobody could be more serviceable in the speaking campaign which is about to begin up there than you, yourself. The issue is to be the tariff. We are to be challenged to justify the pending action of Congress about the import duties. 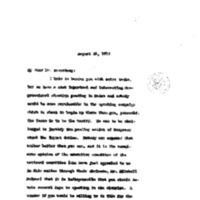 Nobody can expound that matter better than you can, and it is the unanimous opinion of the executive committee of the national committee (who have just appealed to me in this matter through their chaiman, Mr. Mitchell Palmer) that it is indispensable that you should devote several days to speaking in the district. I wonder if you would be willing to do this for the cause. I am sure that they do not exaggerate the importance of it or the service that you could do. Wilson, Woodrow, 1856-1924, “Woodrow Wilson to William Cox Redfield,” 1913 August 12, WWP17926, First Year Wilson Papers, Woodrow Wilson Presidential Library & Museum, Staunton, Virginia.